Don’t let the myths about beauty school keep you from pursuing the career of your dreams. Myth #1. People only go to beauty school when they want an easier alternative to a four-year college. If you’re looking for a “soft” option that allows you to slack off, then beauty school is not the option for you. While it might not take as long to complete as a degree from a four-year college, getting your license through beauty school isn’t a cake walk. In fact, it can be downright demanding. Some people even avoid beauty school because they feel that it’s too challenging. But with the experienced and dedicated instructors at Cobb Beauty College, you’ll have the support you need to make it through with flying colors. We are proud to say that we have a 100 percent licensure exam pass rate. Myth #2. You’ll have limited career options when you graduate. When you told your parents that you want to go to beauty school, was their first response, “But what about your career?” Many people think that the only career options for beauty school graduates is a job the local hair salon, and while that is a great option, in reality, you have a plethora of career paths you could choose to pursue. Whether you choose to open your own salon, work in a corporate studio, a family-owned studio or one of the many other paths available to you, you’ll never be stuck in just one career with a cosmetology license. Myth #3. There’s no demand for cosmetologists. This is just flat out false. According to the U.S. Bureau of Labor Statistics, the cosmetology industry is projected to grow a full 10 percent by 2024, which is faster than the average for all occupations. Unlike many other careers, as a cosmetologist, you’ll never have to worry about your job being outsourced overseas. After all, it’s not possible to get a haircut online or from a call center. As long as people still have skin, hair and fingernails, there will be a demand for cosmetologists. When it comes to beauty school and cosmetology careers, the list of myths and misconceptions goes on and on. But as you can see, many of the myths about beauty school and cosmetology are just flat out wrong, and they definitely shouldn’t be the reason you choose not to pursue a career in cosmetology. 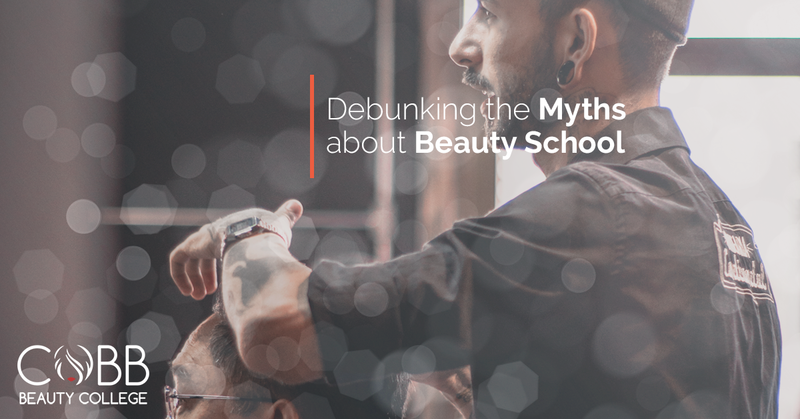 If you would like to learn the truth about more beauty school myths, be sure to stay tuned for our next blog. And if you have questions or concerns about our beauty school in Kennesaw, Cobb Beauty College, contact us! We are always happy to provide you with the information you need.